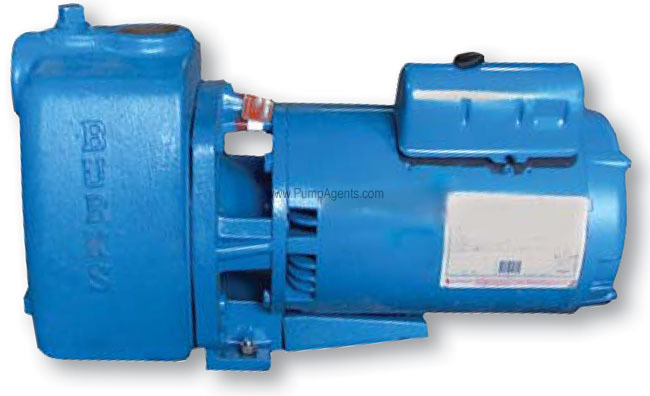 Burks catalog # 320WA6, Self Priming Centrifugal Pump and Motor unit. Bronze Fitted Cast Iron Construction w/ Plastic Impeller. Close Coupled to a 2 Horsepower, 3450 RPM, 230/460 Volts, 3 Phase Motor. Ports are 1-1/2 Inch NPT Inlet, 1-1/2 Inch NPT Outlet. MATERIALS OF CONSTRUCTION Adapter Cast Iron Casing Cast Iron Diffuser Cast Iron Impeller Noryl Plastic Shaft 303 Stainless Steel Shaft Seal CarbonCeramic / S. Steel / BunaN MAXIMUM OPERATING CONDITIONS TEMPERATURE For Standard BunaN Seal 225F 107C INLET PRESSURE 100 PSI 690 kpa CASING WORKING PRESSURE 200 PSI 1379kpa VISCOSITY 200 SSU APPLICATIONS • Lawn Sprinkling • Pressure Boosting • Sprinkler Systems • Light Irrigation • Dewatering clean liquids • Transfer from underground storageFEATURES • Fast Priming pump stays primed. Flapper and check valves on suction pipe are not required, but are recommended. • Nonoverloading performance at all catalog ratings. • motors. • Leak Proof mechanical shaft seal self adjusting. • Cast Iron Casing with suction, discharge, prime, vacuum gauge and drain tappings.